As with most quilts, we had the option to either do an all-over quilting pattern or quilt “to the block”. To keep it interesting, I did a jagged stipple filler in the background but did a custom design within each block. To test out designs before committing thread to the quilt, I placed a piece of glass from an old picture frame on top of one of the blocks, and used a dry erase marker to do some sketching on top of the block itself. All the quilting lines coming together at the peak of the triangles added more bulk to an already bulky place in the block due to the convergence of the seams for the piecing. That was a lot of matchstick quilting, and it might cover up some of that fun Modern Marks fabric! So back to the literal drawing board. 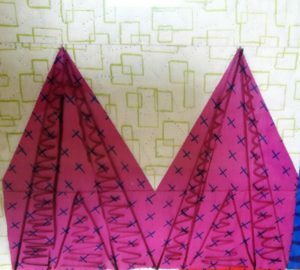 In this new version of the quilting, I free-handed some abstract fan shapes coming out from a less bulky part of the block. When coupled with the “stitch in the ditch” around each of the blocks, it gave me enough pop to show off the shape of the block without covering the fabric too much. 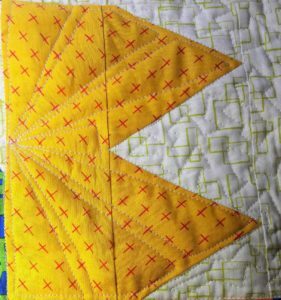 It’s worth noting that in the final quilt, I used a pale yellow thread in the background, and a pale green in each of the blocks regardless of the fabric color. Here’s what the final quilting design looks like in thread instead of dry erase marker! Now the exciting part! Benartex is providing a bundle of 8-10 Modern Marks fabrics for us to give away as part of the blog hop. This drawing is open to US residents only, so be sure to enter our Rafflecopter raffle below, and visit all the stops on the Modern Marks blog hop for more chances to win! Pssst…. if you want to know more about Christa, check our sewlebrity interview with her on YouTube! I love Christa’s first fabric collection. The colors are so vibrant and fun. Love your show. Thanks. I would like to learn more about different quilting designs. Gosh, I don’t have a suggestion. I must admit I am not familiar with this show. I will have to tune in! thanks for the opportunity to win! I just found your site. I have a lot of looking around to do. Love the way you explained your quilting designs. Going to try that glass trick! I love to learn anything about quilting!! Keep up the good work! I love ‘the piece of glass from an old picture frame’ tip for auditioning the quilting plan. Any posts on quilting with your walking foot are my favorites. I want to learn to machine quilt, so info on that would help me. I would like to hear more about McTavishing quilting design. Thanks for showing your possible quilt pattern and explaining why you decided against the first and went with the second. I would like to see more of that. 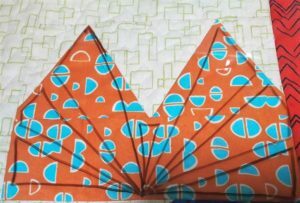 I would like to see more fmq ideas and techniques. Book revies would also be good. I enjoy finding new-to-me bloggers by tuning into blog hops! I really like your groovy quilt. The Modern Marks fabric line is delicious. I’d be interested in learning about your design process. Love this fabric line and your explanation of quilting choices is helpful. More quilting designs!! Thank you! Tips for choosing quilting designs is always helpful. I hate the phrase quilt as desired – maybe a subtle conversation about quilting designs and proding quilt designers to include quilting designs in their patterns. Thanks for the good tutorial on marking for quilting. Great ideas! Love the quilting on this one. Thanks for the chance to win! This blog hop has brought me to your website for the first time. I look forward to reviewing your content and offerings. I am interested in different quilting patterns–as a newbie in machine quilting! Quilting on a domestic machine….made easy!!! I would like to know more about quilt as you go. Thanks for sharing your quilt using this lovely fabric. Great info about testing quilting designs. Good use for the scrap fabrics and batting. Maybe a talk about value? Show how to take a picture of the fabric to be used, in black and white, to show value instead of color. I’m a new follower but would learn more about how to quilt with my domestic machine. I like that you show your quilt designs and why you chose or not chose to use them on your quilt. Like Star Blocks and more variations of those designs are my favorites! Very good idea you have…using a piece of glass to aide in sketching out your quilting design. I recently learned to FPP…I would like to see a show which includes that. Thanks for the idea of using frame glass.. It is a new to me idea.. I need to try out many ideas to get the right one for my quilting. I would like to know more about selecting a good pattern for quilting. I’d like to see ways to quilt with the walking foot. I like new ways to quilt quickly. Thanks for a great giveaway. I would also like to learn about quilting with the walking foot. I tried wavy line quilting once, and it looked awful! I would like to learn how to space the lines evenly, and would like to learn other edge-to-edge designs. Maybe trapunto quilting? I know it is an oldie but it looks amazing. I am most interested in how to improve my machine quilting on my domestic machine. How to handle the bulk & how to improve the lines so they are smooth. I would like to hear more about quilting using a walking foot. I love how this quilt turned out and I was so happy to share the quilt in person! I am always interested in how others choose their quilting designs. I hadn’t thought of the stitching adding extra bulk. I’ll add that to the list of things to think about when quilting. I too use a piece of glass to try out quilting designs. I can’t wait to begin using my stash of Christa’s fabrics! Never knew about this website. Good thing you’ve linked up on this hop. I am always interested in improving my machine quilting skills, so anything along that line would be great!! I like how the quilting turned out. Hi Pam and Lynn, it’s cool to discover your show. I’d love to see more about quilting design and techniques. I.e putting the glass frame over the project to sketch it out. That’s so awesome, first I’ve heard of. Beautiful fabrics and a great fun pattern! This may be common knowledge to many quilters, but I’d like to know more about “leaders and enders”. I don’t understand the idea very well and want to know if it would help me! I also love any kind of modern techniques for quilting! Beginning FMQ on domestic machine. Thanks for the chance. Fabulous quilt! I’d love to learn more tips and techniques for appliqué quilting. Thanks! I’d love to hear your tips on domestic machine quilting! Paper piecing tips are good! I’d like more tips on quilting on my sewing machine. I don’t have a long arm. I guess I always love the new rulers or new techniques. Great quilt, love the color. Since I found this website only today and haven’t seen any of your videos yet, I am not able to answer your question yet. I look forward to checking everything out. I would love more quilting designs. I seem to get stuck when I get ready to quilt. I would like to learn more about using today’s fabric to make more traditional looking quilts. Since I’m a beginner, I love episodes on easy machine quilting that look much more advanced. I love how you quilted it. It really made the quilt! I just started watching your show, so I don’t know yet what might be missing. Deciding on a quilting design is always a helpful topic. Thanks for the quilting suggestions…anything to help figure out the best quilt design. Quilting with a regular sewing machine. How to make it easier to quilt. This looks like a very fun fabric collection! Thanks for sharing your quilting ideas and how you you preview them before you quit. Thank you for sharing how you preview possible quilting designs! I enjoy seeing the process when choosing quilting designs. This helps to get me out of my quilting rut. Gonna try something new. I’d like videos on new ideas for fast patchwork style quilts. First time visitor! Love your blog and your tips! Thanks! I am so anxious to make something different from my usual style with this beautiful fabric! These are great fabrics for just having fun. This is my introduction to your site, so I will have to look at what you already talked about before I can make an intelligent suggestion. I do like your quilt. 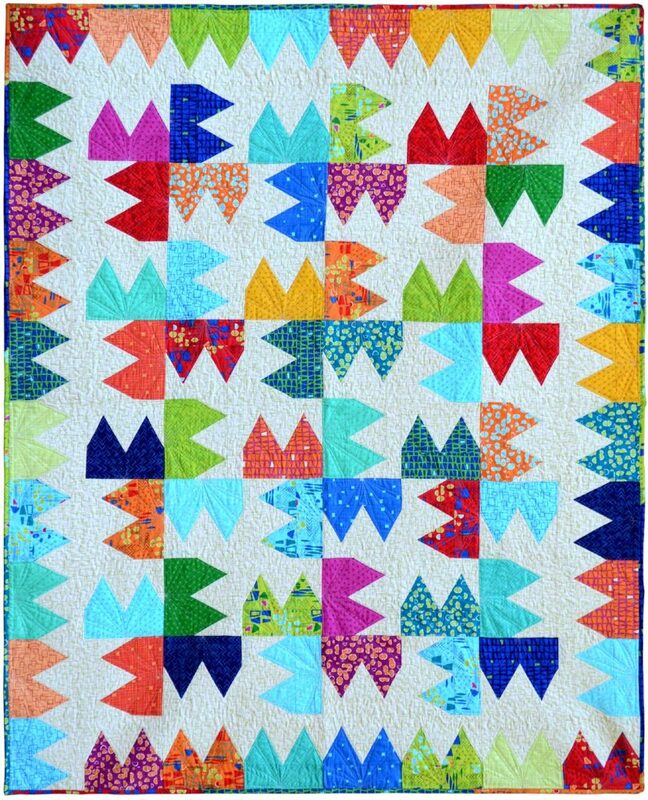 The bow-like quilting in the colorful parts looks great, and the background quilting is perfect for the fabric pattern. Good choices. I like your quilt design, too! Thanks for the chance to win the fabric, and thanks to Benartex for supplying it. I’d love to use it in a great design like yours. I just found your wonderful site! I’m not a novice quilter but I am a novice machine quilter! I’d love to learn more about stitching patterns, beyond the simple straight lines and all-over meandering. I’d love to see any tips of quilting with rulers on a domestic machine. How many different templates do you really need? straight, curves, circles, etc. I’d like to see more about choosing quilting designs. I just watched you guys interview Christa…it was so cute. I didn’t realize that there are so many pod casts out there. I usually listen to music or put on a musical when I’m sewng. Which threads you should or can use. Thanks! EPP! Thanks for the opportunity to win! Your blog is new to me. I like what you did with the quilting on this quilt. I look forward to following you!